(Please attend the Stamford Master Plan Meeting on Tuesday, October 7th at the government center - 888 Washington Boulevard - at 6:00pm). I've been to a lot of town meetings - including the Merritt Parkway Trail meetings of Westport, Stamford, and, most recently, Greenwich. It was at the Greenwich meeting a couple of weeks ago I recognized a familiar sight: Town Hall Meeting Curmudgeon 1.0. No matter what town or city you live in, you know who I am talking about. Town Hall Meeting Curmudgeon 1.0 can't say anything without first relating the number of decades they've lived in the place they live in. They wag their index finger like it's a bodily function. They ignore facts that don't support their own assertions and use fear as a kind of constructive Play-Doh to build their own reality. If Town Hall Meeting Curmudgeon 1.0 hears anything he or she doesn't like, THMC1.0 will sit and cross their arms like a sulking child. Sometimes this will be preceded by a brief, talk-to-the-hand gesture directed toward the person they want to tune out. This was on full display at the Greenwich Merritt Parkway Trail meeting. Now as you know I have no love for that project but I have to take issue with a couple of THMC1.0's at the meeting who insisted the trail supporters from out-of-town who were attending shouldn't be speaking because, well, they don't live in Greenwich. Of course, at least one non-Greenwich resident that I know of spoke out against the trail and yet that person wasn't scorned or rudely interrupted (and state and federal tax dollars are everyone's business no matter where the money is spent). After having a finger wagged in my direction at the Greenwich meeting for committing the non-pardonable act of riding a folding bike there and talking about it, I decided that I've had enough of THMC1.0. It is an antiquated piece of equipment that inspired the creation of the town leaders from 'Footloose.' It is time to build an alternative, and I need everyone's help to do it. To be clear I'm not suggesting THMC1.0 should go away. Their voices count just as much as anyone else's. But it is time for cyclists in Stamford (and everywhere else, for that matter) to launch Town Hall Meeting Curmudgeon 2.0. If I made it an app, I'm sure I could get funding. They put down Candy Crush and Zimbio quizzes to attend town hall meetings in the first place. They post about upcoming town hall meetings on social media and tell everyone and anyone they are attending. They raise their hands at town and city meetings to speak up. And when they introduce themselves they often say how many weeks or months they've lived in town - and how many years they want to stay in town. They talk about how they want their town or city to look in the years to come instead of being nostalgic about the way the town or city they live in used to be. They have a firm command of the facts - but know how not to use them in a patronizing way. They talk about economic benefits of important improvement projects like bike lanes and bike parking - and also gently remind everyone that cyclists don't drop out of the sky but instead give out car parking spaces as gifts. They respect the opinions and voices of others and don't ever get personal or patronize those making dissimilar arguments. THMC2.0 takes many forms: a young apartment dwelling woman who frequently loses track of how many roommates she has. A frustrated commuter who has his or her folding bike at their side. A cool mom with two well-behaved kids seated next to her. A dad with two well-behaved kids seated next to him. A new voter. An intern. A person born after 'The Goonies' was in theaters. High heels. Sneakers. Dress shoes. Only the T-1000 can take as many forms as THMC2.0. The most important distinction of THMC2.0: They outnumber everyone else and they are the ones most remembered when the meeting adjourns. 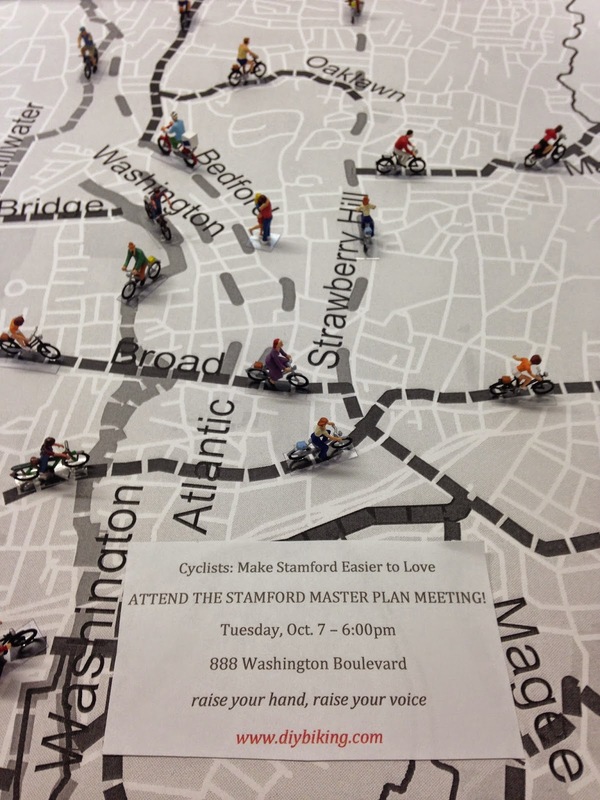 So Stamford, with its patchwork of bike lanes and little in the way of infrastructure, has a Master Plan meeting on Tuesday, October 7th. This is where we turn things around. This is the Adlai Stevenson at the UN during the Cuban Missile Crisis Moment. But like the robotic lions in Voltron, we must all join together to become a powerful force. Are you too young or too old to understand that reference? Substitute 'Voltron' with 'Constructicons.' What about now? Still don't get it? Good. You're the one I want at the meeting. Wait. You're forty and wearing a 'Voltron' T-shirt? I want you at the meeting too. Seriously: you need to bring a crowd to influence one. If THMC2.0 outnumbers (and outclasses) THMC1.0, it is THMC2.0 that will be remembered - especially when zoning boards, planning boards, and town representatives sit down to talk afterwards. Please attend the Stamford Master Plan meeting on Tuesday, October 7th at 6:00pm and form THMC2.0. And, a few short days later, go to the Mill River Greenway rally. After all, cities are built by the people who show up. Thanks for reading and thanks, more than ever, for riding.